Since John 3:16 is often considered the most powerful verse in the Bible, it only makes sense – at least once in our lives – to make it the subject of a profound and personal meditation. The purpose of this note, in fact, is to urge you to do so – to make time in your life for a John 3:16 meditation. Let the Holy Spirit convince you to make this meditation, and to enrich you by it (perhaps in a most incredible way). Here is a format I propose for such a meditation. 1. Materials. All you need to have with you is the verse itself (John 3:16) on a sheet of paper – nothing more. You are focusing only on this verse. 2. Location. It is absolutely crucial you go somewhere special and quiet – ideally some place out in nature that places you in the majestic presence of God. Keep in mind that silence is a critical part of this meditation (interruptions need to be avoided). Even being alone in your parked car or room, especially when no one else is around, will work. 3. Body of Meditation (after having placed yourself in the presence of God, and having asked the Holy Spirit to make the meditation profitable to you). A. Read John 3:16 slowly and silently as many times as you may want, letting the message and meaning of the verse enter into your heart. Go as slowly as you want. B. Acknowledge in the depths of your heart God’s amazing love for you by sending his Son to save you. C. Silently in your heart make any other considerations about this powerful verse that come to mind. D. Wait silently upon the Holy Spirit to give you additional supernatural insight – grace filled insight – about this all-important verse in God’s word, and then spend time in silent, personal conversation with Jesus, sharing your heart with him and letting Him share his heart with you (receptive listening flows from being silently recollected in God’s presence). 4. Praise. Acknowledge and adore Jesus as your Lord and Redeemer. It is permissible in meditation to use your imagination to visualize Jesus on the cross dying for the sins of the world, and to give him praise for loving you that much. 5. Thanksgiving. Profoundly thank the Eternal Father for having sent his Son to save you. 6. Conclusion. Resolve to make Jesus (even more) the center of your life in all that you do. 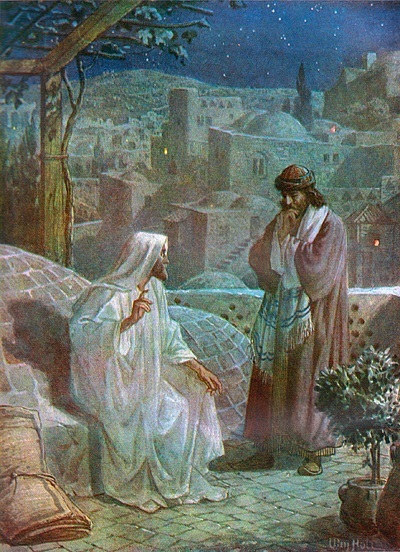 Image: Jesus and Nicodemus by William Brassey Hole (1846-1917). Public Domain, U.S.A. (at Wikipedia).